Bouillabaisse, one of my favorite fish stews, can be time consuming and labor intensive if you start from scratch by making the fish stock. Sometimes you just want to have this delicious meal quickly without too much fuss but still with the savory flavors associated with Bouillabaisse. Heat olive oil in a medium stock pot. Add shallots, fennel and leeks cooking for five minutes until soft. Add garlic, pepper, sea salt and crushed red pepper cooking for a minute to release flavor. Next add clam juice, tomatoes, wine, bay leaf, and saffron Simmer for 20 minutes to allow flavors to combine. Add mussels continue cooking for 5 minutes. Then add shrimp cooking for 2-3 minutes before adding white fish and calamari rings simmering an additional 5 minutes. Gently stir stew. Finish by adding scallops to stew, stirring to coast then simmering for 5 minutes. Serve individual bowls with toasted french bread. 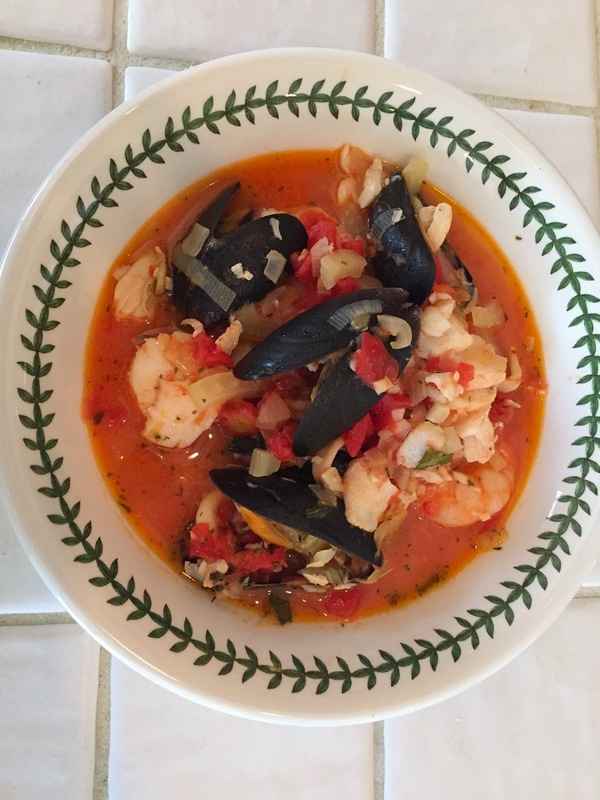 For wines try a Sancerre or Chiblis to savor with this delicious fish stew!